Nothing in and nothing out this week. That’s boring, isn’t it? I had hoped to bust a full 50 yds. before the year is over, but I don’t think I’m going to get there. That’ ok, though. My plan for next year is to just keep plugging along, making forward progress. I don’t think I want a set number I am aiming to reach. That just puts added pressure on me, and makes me feel like I failed, if I don’t reach it. I took some pictures of the current state of my stash. The fleece stack has shrunk from what it was, and I now have room to store some of my thread on that little fabric shelf. Before, that was full of fabric. Also, there is some space on the one bolt slot. Those were packed in tight. The bottom area definately needs some attention…lol. Even though I’ve busted 85 yards you really can’t tell by looking at it. I’m figuring that it was abouy 1%! LOL! It’s times like this when you truly know who your friends are. The ones that support you. Who want to see you suceed 100% in everything you do. So send it to me. I’ll sacrifice so that you can suceed in bustin that stash 😉 Anything for a friend I tell ya…. 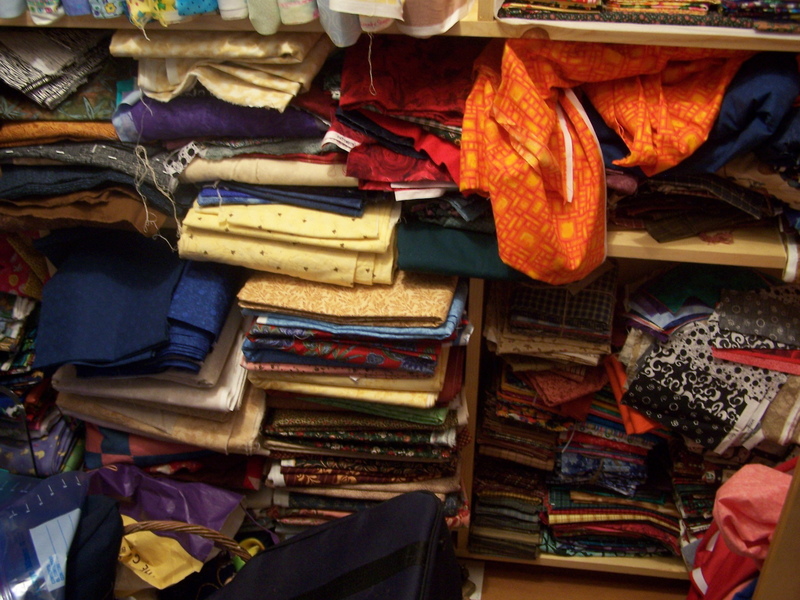 Love all the bolts of fabric…it IS like shopping at a store. Keep grabbing stash here and there and you’ll start seeing more empty space. That’s a heck of a stash. It might even take 2 more years! I LOVE your stash! Just go shopping in there with every idea you get. 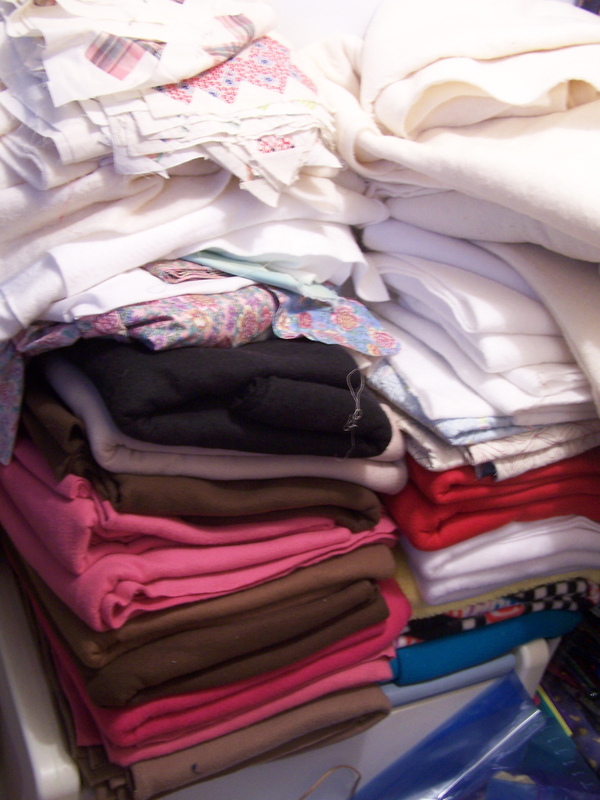 Don’t fret so much about “matching” and start throwing stuff together for your next project. You will be very surprised at what “goes” together ….. not necessarily “matching”. I think I am glad mine are in crates and not in bolts. That would terrify me. You could count the bolts. The crates are countable too but what is in them is not so obvious until you undo one…. That would fix me…to have to undo and photograph the contents ……would take a lot of photos to get some idea vs the bolts. So they win out in that direction. Happy sewing. Someone is going to use them…someday, if not you and they will be happy….at least that is what I hope. Mine was like this until I took the fabric off the cardboard forms. (and the shelves broke under the weight) That reduces the volume by about 1/2. I can’t say I’ve done any stash busting but at least it fits in a smaller space now. Wow! Do you feel exposed? My stash is almost as bad (which really means good) as yours! Maybe I should shop your stash next time I need to make a purchase. 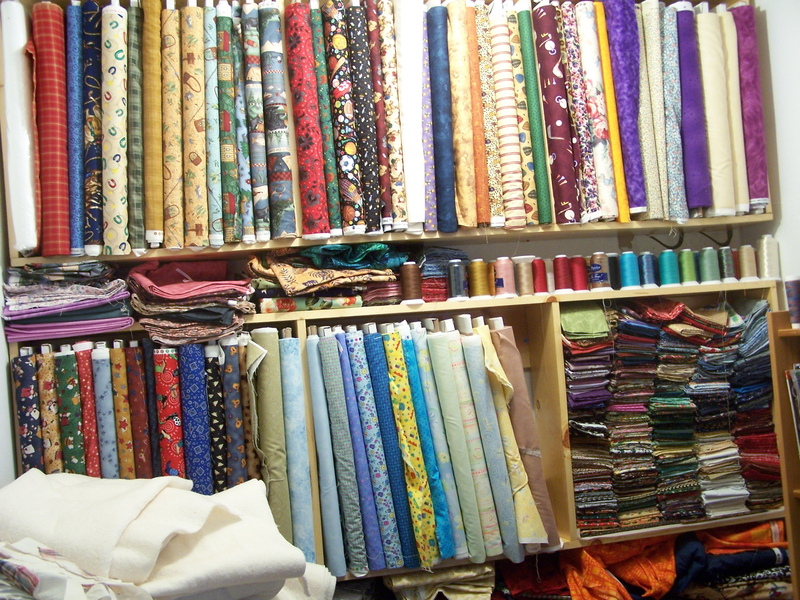 I live in small USA as well, so I completely understand the no fabric store near by. just keep plugging away and it will whittle down eventually. My stash must be bigger than I think cuz I’ve busted close to 350 yards and there is still not a clear spot on my shelves! LOL But I’m still hanging in there! it helps to have others trying to do the same thing. Hmmmm is that your stash or your LQS? Maybe that is the same thing. W O W!! Have fun busting that. I am impressed with the size of your stash. I only have 150 yards but you seem to have 150 tons. I am jealous. Wow that’s a lot of fabric! I thought my stash was large but it’s only about 1/2 the size.